I never miss breakfast. I think of my weekday breakfast as my one chance to do something good for myself. A meal that has the potential to be so totally virtuous that it can cover up a multitude of lunchtime sins (in which I have been known to indulge)! During the week, I don’t need variety–I just need something relatively fast and healthy that will give me the energy to get through the morning. In the colder months, I make oatmeal every day–the stovetop kind, dressed up with nutmeg, cinnamon, raisins, walnuts and blueberries. I love this breakfast. But once it starts getting towards the warmer months, cold cereal is usually on the menu. In the summer, I make a mega-mix of very grown-up cereal: Shredded Wheat, Grape-Nuts, raw rolled oats, raisins and walnuts. It’s a pretty intense amount of fiber, but that’s how you know you’ve grown up–you start thinking about things like fiber! 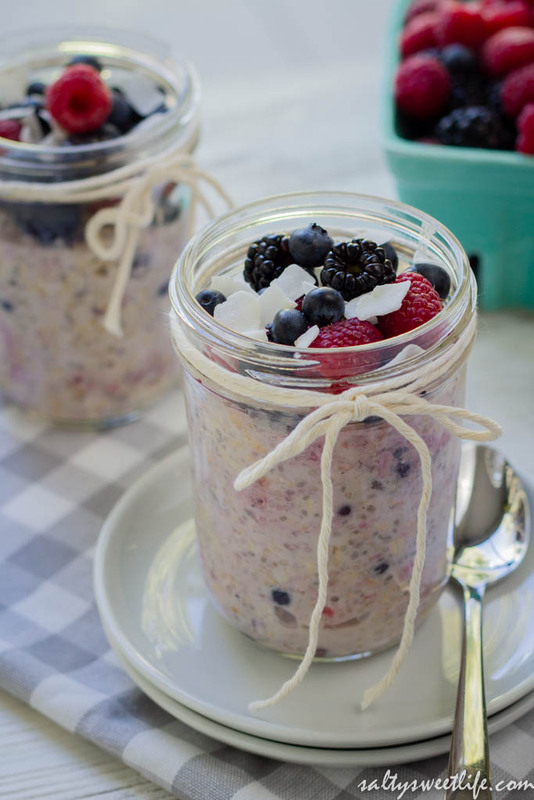 I had been pretty satisfied by my winter/summer weekday breakfast lineup, but then I started seeing this recipe from The Yummy Life for “Overnight No-Cook Refrigerator Oatmeal” circulating on the internet. I admit, I was intrigued by this idea of making breakfast overnight, but I kept putting off trying it. I wondered, as I’m sure some of you have, what cold oatmeal would taste like? and what of those chia seeds? aren’t they the same seeds that you grow Chia Pets with? Well, after months of staring at it on Pinterest, I decided to give it a whirl. I already had plenty of oatmeal (seriously, I buy it by the cartload from Costco), so the only thing I’d need to get were the Chia Seeds (which can also be found at Costco). I used the recipe from The Yummy Life as a guideline and I was blown away by how delicious it was! I brought some into work and shared it with my coworkers and they loved it too! Over the past few weeks, I’ve made some tweaks to the original recipe and come up with a mixture that’s very filling, tasty and so satisfying! It is so delicious that I actually look forward to eating it and I’m always a little sad when it’s gone! This oatmeal has changed my life! Ok, maybe that’s exaggerating, but it has saved me at least 15 minutes in the mornings! That’s 15 minutes less time in a pre-caffeinated fog making oatmeal! Have I mentioned the time I grabbed the cumin instead of the nutmeg? Apparently chia seeds, (and yes, they are the same seeds that you used to grow “hair” on your Chia Pet) are very high in fiber and Omega-3 fatty acids. When soaked in liquid, they expand and create an almost pudding-like texture to the oatmeal. My recipe is nice and thick and it eats like a meal and because it’s eaten cold, it’s perfect for the warmer months! I offer this recipe as a guideline. Because we normally use almond milk as a dairy milk alternative, I have used it in this recipe. You can certainly use dairy milk, but you may need to adjust the sweetener to your taste as almond milk tends to have a little sweetness already. I also use plain yogurt because I like to be in charge of the amount of sugar I use. You could use vanilla yogurt instead and again, adjust for sweetness. You can use whatever fruit you prefer. My current favorite is a frozen triple berry blend (blueberries, blackberries and raspberries). Using frozen fruit is so convenient, but you can use fresh fruit as well! 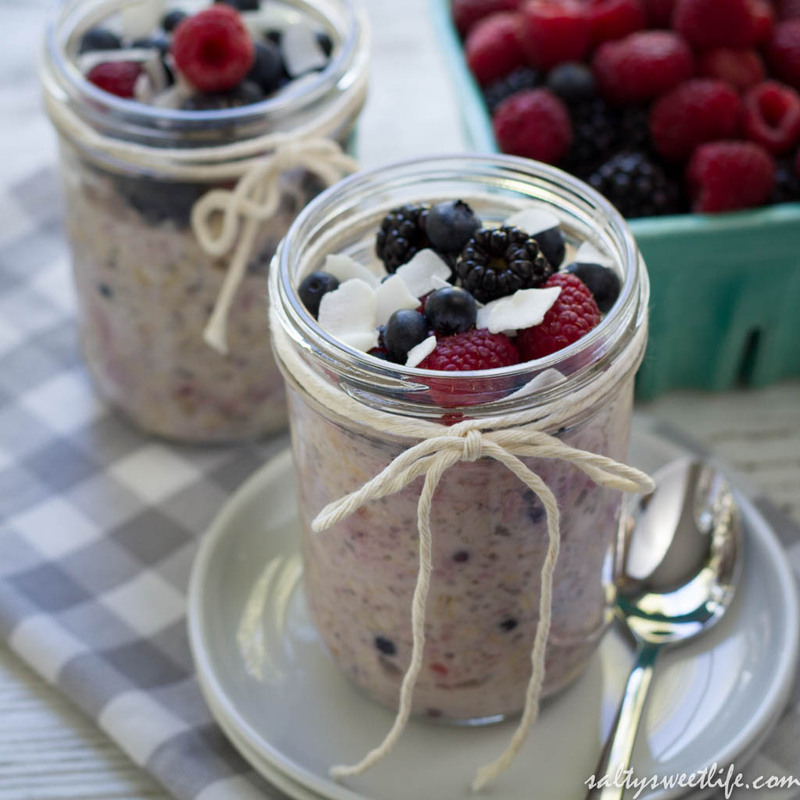 Place all ingredients in a 16 ounce mason jar or other resealable container. Shake the contents until thoroughly mixed and place in the refrigerator overnight. This looks delicious, Tracey! I’ve tried some of these, but your recipe looks both healthy and tasty as well. I’m going to give it a try! Thanks for sharing! Thank you Jodee! I hope you like it as much as we do! It’s fast becoming a staple in my house! These are too cute! 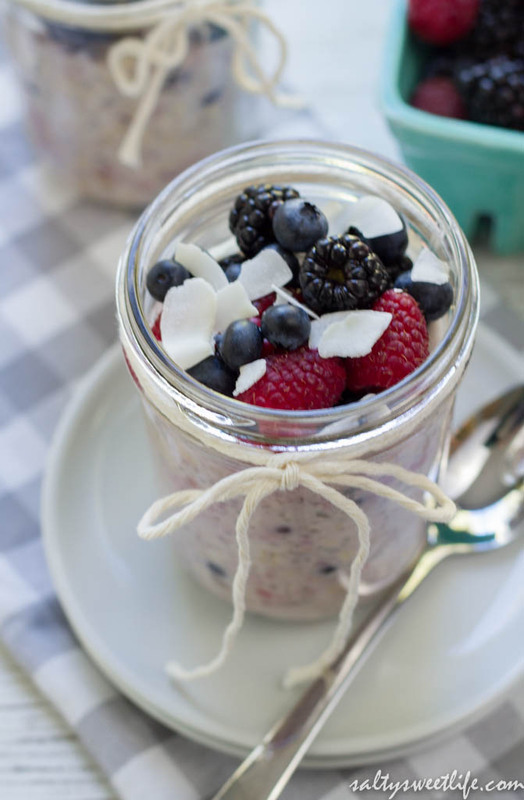 I love overnight oats, such a great and healthy breakfast on the go. Thank you! I can’t believe it took me so long to finally give it a try! So glad that I did! bravery to go ahead and give you a shout out from New Caney Texas!